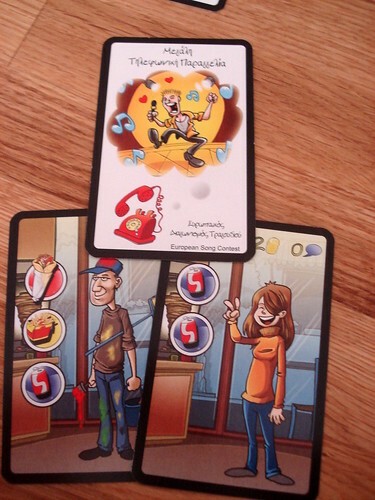 Welcome to Souvlaki Wars, the Greek Fast Food card game. As you can read from the introduction – and from the game’s title – the city is too small for all the souvlaki vendors and there can be only one King of Gyros in the end. For us hungry customers, the situation is not too bad because the main battleground in this war is the customer’s stomach. That came out much worse than I intended. What I meant to say was: the winner in this war is the restaurant owner who makes most customers happy. That sounds much better, almost like a new Gordon Ramsay TV show. Chef Ramsay, if you want to create a new TV show based on the concept, I’m certain the game’s author Vangelis Bagiartakis will be glad to negotiate. What you want to do in Souvlaki Wars is feed your customers, so that’s where the game starts: food and customers. Customers demand four delicious products: gyros, souvlaki, fries and sodas in different combinations and quantities. By an amazing coincidence, that is just what we sell. We only need the right food cards that also show those four fast food favourites in different combinations and quantities. Every round, a bunch of undecided customers are hanging around on the plaza between our Greek quick restaurants. They know what they want to eat, they just can’t decide where, and so each souvlaki chef – or souvlaqueur, as the they are called in culinary French – gets to drag to confused customers into his gourmet temple. A third customer inconsiderately and randomly calls you for a food delivery. Feeding your customers is more random than any profitable restaurant would be comfortable with: your kitchen keeps churning out random combinations of dishes, and you do your best to satisfy hungry people with them. You play as many food cards from your hand as you wish and all customers whose order is fulfilled with that leave happily, paying you in money and by spreading the word about your great food, increasing your reputation. To your business’ detriment, Greek customers stand in line just as orderly as the British, waiting politely until everyone who came in before them got their food. So, that dude in front of the line who wants three souvlaki when your kitchen only produced one this round? He’s costing you a lot of money right now. Customers that don’t receive their food immediately show some patience at first: if you don’t serve them in the round they came in, they’ll stay without any complaint. If you don’t service them in the next round, they walk out and talk bad about you, your restaurant and possibly your mother. They also reduce your reputation by twice the amount you would have gained had you sold him some food. Hunger makes people cranky. Deina Apaftos looked up from the counter just in time to see half a cow walk out the front door. “Hey, what do you think you’re doing there?” A face appeared above the cow for a moment, just long enough to be recognisable as Tade Foufoutos, before the stink bombs in the storage room went of with a wet BOOMF sound and Thessalia’s Tavern was filled with the smell of rotten eggs. There’s preciously little war in this Souvlaki Wars, isn’t there? That’s because I didn’t tell you everything yet. The missing ingredient are the red action cards. There are plenty of them to go around, you start the game with three of them and receive one more every round. Some of them are benign, helping you fulfil customer demands by giving you more food cards or rearranging the line in your restaurant. Others, however, are offensive and reverse an opponent’s queue, make him unable to serve telephone orders this round or send the dread souvlaki ninja to pillage their storage. None of these cards are malicious enough to ruin someone’s game on their own, but they can certainly stop an opponent that is getting close to victory, and they are very satisfying to apply to an enemy. At the start of each round you get a new action card and the option to buy fresh food and do advertising (convert money to reputation). The rates to buy food and ads vary depending on your restaurant, as does the monthly maintenance cost you have to pay. The game ends when one restaurant owner has emerged as the most rich and most famous, meaning he has 25 or more in both money and reputation at the end of a round. The way there is paved, for the most part, by luck. Your food is completely random, your customers are semi-random and which action cards you draw also has a big impact on your chances. Actually, the action cards your opponents draw might matter even more. But I don’t want to be mad at Souvlaki Wars for the amount of luck required to win. It never pretends to be anything but a light, fun card game to play over dinner at your local souvlaki place.There is still enough strategy here to not be a complete luckfest: when do you play which red card, when is it good to advertise and when is it better to let customers wait for a round than to waste a lot of food because you need one more soda but the only card you have also has three fries? You do make decisions, but if you’re unlucky they won’t help you. The illustration style adds a lot to this light game as well: no two customers look the same, they all have been lovingly illustrated and the characters even match the order they place. The same goes for action cards, which are painted in the same cartoon style. However, you might want to update your glasses prescription if you don’t read Greek because Souvlaki Wars comes in a Greek/English bilingual edition and the English text is tiny. 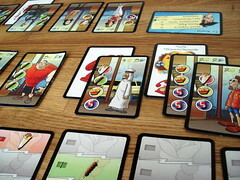 A more annoying detail is the limit to four players: Souvlaki Wars plays quickly enough that it could entertain six people without any problems if there was a few more components, and the added chaos from having more red cards would be even more fun. But in four people Souvlaki Wars is still a very entertaining game – it does lose some of its appeal with less players, in my opinion – and works well as a family game, too. Despite the war part of the name. Thanasis Tetoios rubbed his hands as he heard the police sirens speed past. The smoke cloud coming from Le Souvlache filled most of the sky, and in just a few moments the police would find Deina Apaftos’ passport at the scene of the crime and go back to the police station with the alleged arsonist already in custody. And then Souvlakia by Thanasis would once more be the only souvlaki joint in the neighbourhood.